Seeing the origin story of Stanley and Lizzie in Time Travel Mater has allowed me to appreciate Radiator Springs Curios much more than I otherwise would have. It's rather sweet to think that Stanley built this store for his loving wife to allow her to house her burgeoning souvenir sales and establish a classic piece of Radiator Springs architecture that would allow Lizzie to pursue her passion. As such, though it may not be as pretty or sleek as some of the other edifices in town, it retains every bit as much charm and character, if not more. Indeed, the Curios shop is a buzzing hub of activity at all times. It's a must-stop for even the weariest of travelers at Radiator Springs! 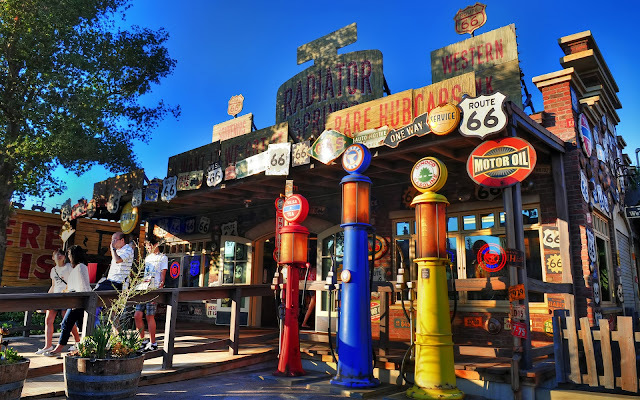 The front porch of Radiator Springs Curios in the afternoon.